I recently came across a great question on Facebook’s iPhone Filmmaking Community page. Jonny Cates asked, “Does anyone know of a way to adapt a monitor to an iPhone?” In other words, Jonny is looking for a way to shoot with his iPhone while watching the output on a separate monitor. In other other words, he wants a remote field monitor for his iPhone’s camera. I was preparing a reply when it occurred to me that this might be a good Q&A to share on HHH. So, I’m sharing! There are several ways to accomplish this feat. The simplest way to connect the the iPhone directly to your monitor using any of the iOS video cables that Apple has so kindly created. Depending on the iPhone model you’re sporting (dock vs Lightning connector), Apple has cables for composite video out, VGA video out, and HDMI out. But, what if your iPhone is on a crane, or far enough away from the monitor that you require a wireless solution? 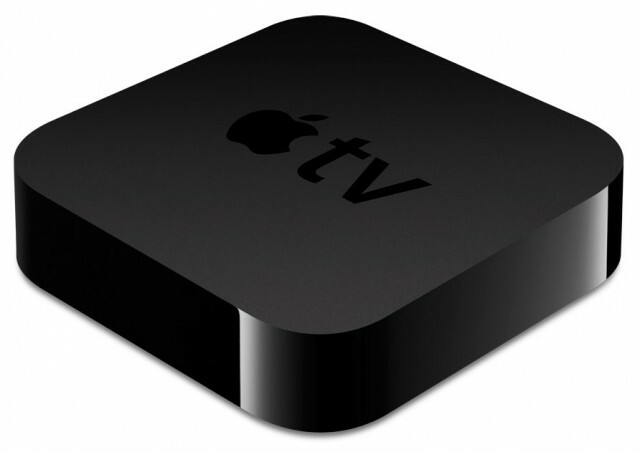 Apple TV to the rescue (as long as you’re near a power source). First, connect an Apple TV to your field monitor (using an HDMI, or HDMI to VGA cable). Then, create a “personal hotspot” on your iPhone, and connect your Apple TV to that new WiFi network. Finally, select the Apple TV as your iPhone’s AirPlay destination and turn on mirroring. Boom! Here’s a variation of that last solution that uses a MacBook in lieu of an external monitor and Apple TV. On your Mac, launch an app called Reflector. This app turns your Mac into an AirPlay receiver. Now, set up an Ad-Hock Wi-Fi network on your MacBook and connect your iPhone to it. 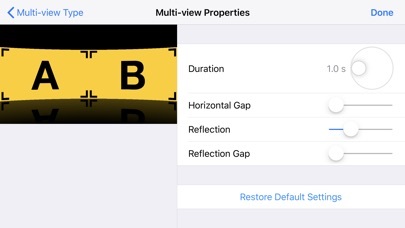 Then, select “Reflector” as your iPhone’s AirPlay destination, and turn on mirroring. Boom again! 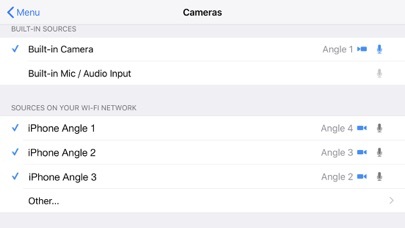 There are a few camera apps that will stream live video (while recording) from one iOS device to another. 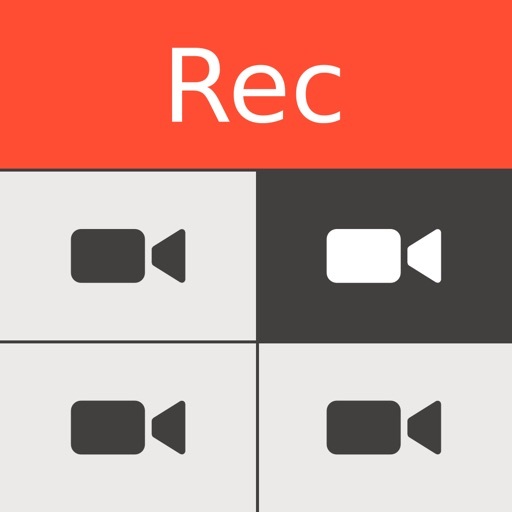 For instance, you could use something like RecoLive MultiCam (an impressive app designed for live multi-cam shooting). 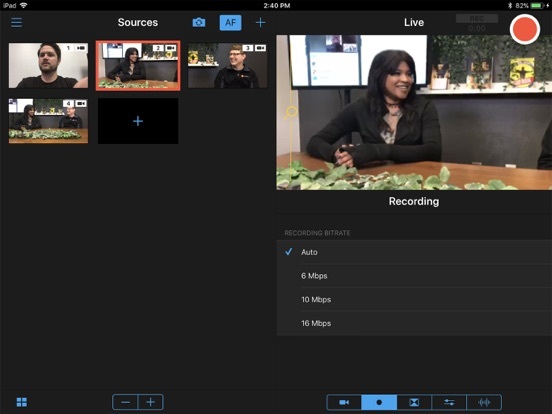 With this app on two networked devices, such as an iPhone and an iPad, you could use the iPad to remotely control the iPhone while monitoring the video it’s shooting. Again, you’d have to create a “personal hotspot” to pull off a solution like this – or use an existing wireless network if one is available. These are just the first solutions that popped into my head, and I’m guessing there are plenty others (perhaps some that are even simpler). Anyone have a good one they’d like to share? Give your talents as a director free reign with RecoStudio MultiCam. 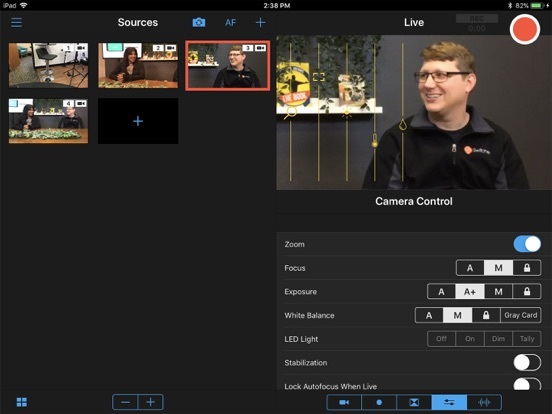 Use your iPad or iPhone as a production switcher and additional iPhones or iPods as video cameras to be able to shoot as if you were in an actual television studio. View all cameras simultaneously, combine images together from several cameras, create transitions from one camera to another! Save your work in Full HD and share it with your friends. Each iPhone, iPad or iPod touch running RecoStudio MultiCam can be used as either a camera or the switcher. The device being used as the switcher shows a list of all the other iPhones, iPods or iPads in use on your Wi-Fi network. It’s easy to select the ones that you want to use as cameras. You can then see the selected cameras’ images and mix them together. With the switcher, you can display each camera’s feed. A red light on the camera screen indicates when the camera is live. 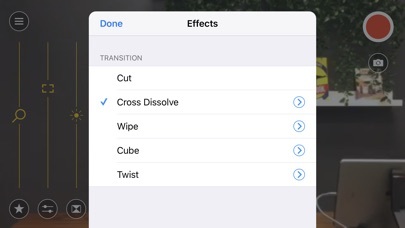 Several transition modes are available: cross fade, wipe, cube and more. Select two or more cameras to combine their images into one view. Several graphic effects are available: dashboard, flap, picture-in-picture and more. From the switcher, you can remotely control camera’s zoom, focus, exposure, white balance, stabilization and torch. Each camera can record video in 1080p Full HD. When filming has wrapped, each camera’s recording output is sent to the switcher which uses this input to create a final product. The resulting videos are of truly exceptional quality. Transfer the final product or all camera rushes to the Camera Roll. 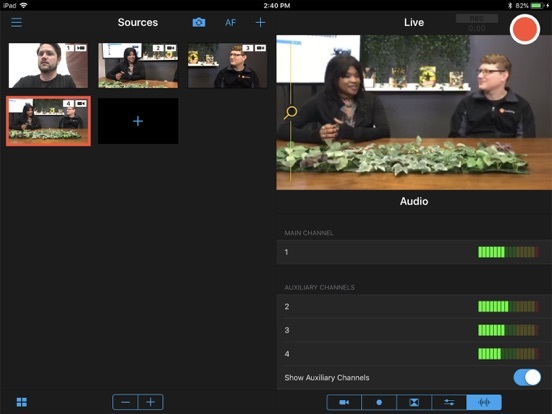 You can then share directly on YouTube, import into iMovie or move to any other application on your iPad or iPhone. Transfer your creation to your Mac or PC via iTunes to import it into your favorite video editing software. 1. You can select the camera used as the audio source for the whole film. 2. Autofocus can automatically be disabled while the camera is live. This prevents the autofocus process to be visible on the production. 3. Tally light (front and back). The app runs on any iOS device running iOS10. A Wi-Fi network is required (the personal hotspot of one iPhone is often enough). The app works without access to Internet. Interested in 4k multi-camera recording or live video streaming to YouTube or Facebook? Consider trying our professional video platform - Switcher Studio. Funny, I was just searching for this exact solution. I just want a small monitor to mount on the tripod next to the iPhone while shooting. S are you saying that a simple video out cable from apple will work? I was also wondering of there was a way to just make my iPad the monitor. Does anyone know if that can be done? Does anyone have any links to how the setup will look? I’m having a hard time imagining the setup. Thanks. I suppose something like that could work, but I think the latency would be murder. Sadly, I know very little about the Windows world. Assuming you have good connectivity for all of your devices, FiLMiC Remote is another option. 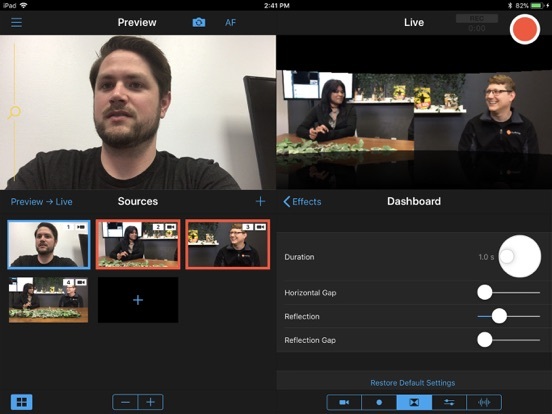 It’s an iPhone/iPad app that can remotely monitor what another iOS device and shooting with FiLMIC Pro.